This is a unit of work designed for KS3 Students centred around The Sailors' Chorus from Wagner's 1843 Opera, The Flying Dutchman. Welcome to our Flying Dutchman Learning Resource. This is a unit of work designed for KS3 Students centred around The Sailors’ Chorus from Wagner’s 1843 Opera, The Flying Dutchman. 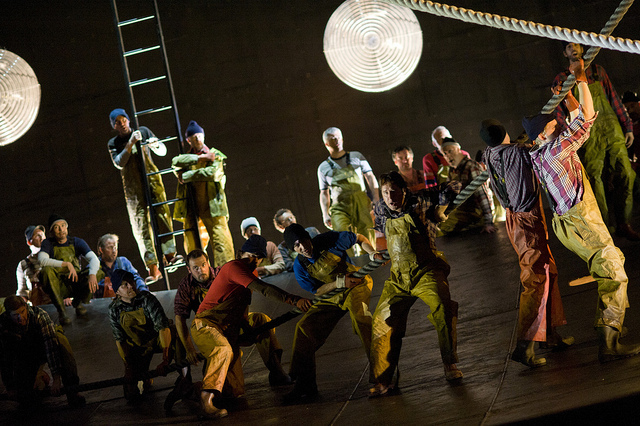 The main focus of the unit involves dramatic singing – having the students become the characters in this part of the opera, a group of sailors singing together. The project includes performing, listening, creating and arranging activities and over these pages you will find all the materials necessary to deliver this scheme of work in your class. At the end of the unit the class will have prepared a performance of their own arrangement of The Sailors’ Chorus inspired by the materials contained in this resource. A CPD supports this resource focussing on healthy, dramatic singing techniques for the classroom. The Flying Dutchman has been cursed for eternity. Once every seven years he is allowed to come ashore to seek redemption. He may have found it in Senta, a woman who longs for escape from her dreary life. Senta accepts the Dutchman’s offer of marriage. But the Dutchman wrongly suspects her of unfaithfulness. Thinking he’s protecting her, he leaves to resume his endless voyaging. Senta is left alone. Click here for the wordsheet of the Sailors’ Chorus. Shortly before the premiere of Der fliegende Holländer (The Flying Dutchman) in Dresden, Wagner had returned from a deeply unsuccessful two-year stint in Paris. He had gone there to make his fortune, but found his way barred by a strict class-based system. One of the bitterest blows came when Léon Pillet, director of the Paris Opéra, accepted his libretto for Der fliegende Holländer – but then commissioned a score not from Wagner but from French composer Pierre-Louis Dietsch. But the Dresden premieres of first Rienzi in October 1842 and Der fliegende Holländer in January 1843 were immense successes, and marked the beginning of Wagner’s career as one of the greatest operatic composers. Tim Albery’s Olivier-nominated production for The Royal Opera delves deep into the psychology of Wagner’s cursed wanderer and his beloved Senta, detailing the monomania and uncompromising idealism that finally drives them apart. Michael Levine’s elemental single set is dominated by a rolling metal hull that represents the Dutchman’s phantom ship, the poverty of Senta’s home and the treacherous sea. Richard Wagner (1813–83) was one of the most significant figures in the history of opera. Through his music dramas he introduced extraordinary innovations that transformed the course of music. His works remain an exhilarating challenge for any opera house, none more so than his 15-hour four-opera epic Der Ring des Nibelungen. Wagner was born in Leipzig and discovered his musical vocation early on. He absconded from his first job when he fell in love with the actress Minna Planer, whom he married in 1836. The tempestuous couple were continually dogged by debt, and twice had to smuggle themselves past border guards to evade warrants for Wagner’s arrest. In 1839 they escaped to Paris, where Wagner spent two dismal years failing to get his music performed and developed a profound contempt for the French – but his time in the home of grand opera had an immense influence on his music. Success finally came for Wagner in 1842 with the Dresden premiere of Rienzi, followed soon after by Der fliegende Holländer (The Flying Dutchman) and Tannhäuser. Wagner’s involvement in a failed political coup meant he and Minna were on the run again in 1848, and Wagner missed the 1850 premiere of Lohengrin while exiled in Switzerland. The backing of the eccentric King Ludwig II of Bavaria gave Wagner, temporarily at least, a position in Munich from 1864. Although Wagner was forced to leave the city in 1865 when public opinion turned against him, the premieres of Das Rheingold (1869), Die Walküre (1870), Tristan und Isolde (1865) and Die Meistersinger von Nürnberg (1868) were all given in the Bavarian capital. Over several years Wagner scraped together enough funding to realize his great dream, for an opera festival dedicated exclusively to his music. The inaugural Bayreuth Festival was held in 1876 and opened with the first performance of the complete Der Ring des Nibelungen, staged in an opera house especially built for it. Wagner’s final opera, Parsifal, was first performed at Bayreuth in 1882, a few months before his death. Fiercely political and determinedly outspoken, Wagner was never far from controversy. His personal life was no less tumultuous, but in 1864 he won a kind of stability with Liszt’s daughter Cosima von Bülow. What drew Wagner to the myth of The Flying Dutchman? You can find backing tracks for this resource here. The tracks are offered at a range of tempos, to help your students build the melodies bit by bit. Watch Bryn Terfel discuss the complexities of The Dutchman, and of working with conductor Andris Nelsons in Tim Albery’s production of The Flying Dutchman.